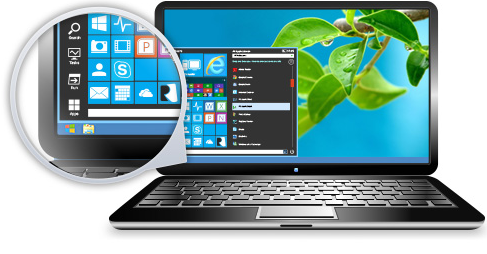 Start Menu Reviver enhances Windows 7/8 by reviving a fully functional Start Menu with an attractive Metro-style interface to enable maximum productivity using your Windows Desktop screen. It retains everything from the original Windows start menu and improves your experience by offering you Essential System Controls, Customizable Shortcut Tiles and other Must-Have Features to help you access and manage all your files, applications and PC settings a lot faster and from one central location. It is also touch-optimized and works with Windows 8 based tablet computers. very bad see "Start is back"
In my previous comment, I had indicated that I liked Start Menu Reviver. With the delivery of the latest updates, I must say that I am very disappointed that the authors of the program have decided to remove the ability to personalize the appearance of the program. (change the colors of the interface and other personalization options. At this point, I am debating whether to uninstall toe program of return to the previous update. I like this program very much, at least the previous version. This mornint I installed the latest version but it will not load when I boot up my desktop. I then used Revo Uninstaller Pro to remove any trace of the program and reinstall it again . It still will not load on startup. I verified the settings and it is checked to load on startup. I therefore had to unistall it and reinstall the older version and it works just fine, I still give it a high mark for the previous version. I got a poor rating and a red doughnut, plus a warning from my WOT plugin on Firefox for this website. I would be extra careful with this developer. I wonder how this developer has not got in touch with the developers of WOT to clear his name. very nice adds a lot more options then standard start menu launcher 33 megs of ram give it a shot you will not be disappointed . Only thing it did not to is display my user icon of user , Windows 7 64 bit ,, keep up the great work ! big improvement for Windows 8 for Windows 7 I would not bother , so for Windows 8 this is a must have !